Created by Admin Team on Aug 23, 2006 9:26 AM. Last modified by David Fiel on Jan 29, 2010 5:15 PM. Step 1: Introduce a broker java script object in the parent form. Step 3: The broker forwards data to the contents of the View Field. Following is an example of how to achieve this communication. Create an application called ViewTest and add this html to the resource (Application property->support files tab). Add a character field (Data) and a button (SendEventToView) to the form. 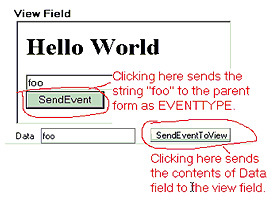 Create an active link (Send Event to View) acting on the View form, action on button click (SendEventToView). Add a RunProcess action and copy the following in the command line. Note: $Data$ is the character field we created in the View form. Open the form on the Web and click the SendEventToView button after setting some value in the data field. (Caveat – The method used here is version specific). Step 3: Broker forwards data to the View Field contents. Create an active link called Handle Event and select the Event as the Execute On condition. Add a Set Fields action and set the Data field to $EVENTTYPE$. Click the SendEvent button inside the ViewField after typing some value in the field. See the snapshot below for more information. Note: Click images for full screen view. Now you should be able to get started communicating between an HTML field and a Mid-Tier form. Re: Is it possible to pass the data from a remedy form to Webpage and again pass the data from the webpage to remedy form..